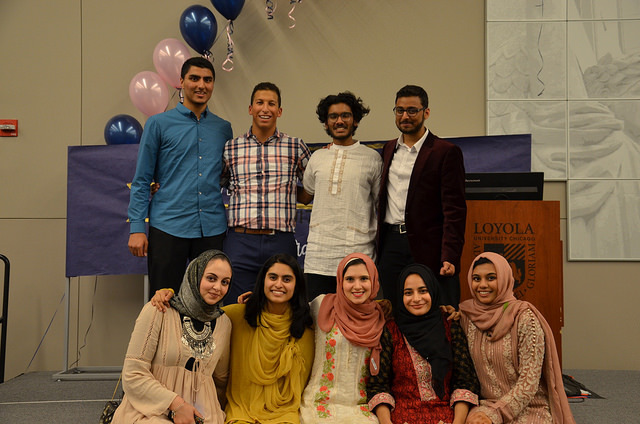 Courtesy of Sajid Ahmed Students of Loyola’s Muslim Student Association celebrated Eid al-Adha, known as the Feast of Sacrifice, with a dinner on Sept. 8 in the Damen Student Center. It’s that time of year again, and Loyola has decked out its buildings with decorations for the holiday season. But Christmas gets more attention on campus than other religious holidays. Although Loyola fosters a space for non-Christian religions to practice their faith — such as in the Damen Student Center’s second floor of Ministry Offices for Muslim, Hindu and Jewish students — there is a lack of public festivity compared to Christmas, such as decorations and activities of other religions’ holidays the entire student body could be part of. Roman Catholicism is the largest religious group on campus, according to Loyola’s undergraduate admissions’ latest report. The report said the 2016 first-year class identified as 60 percent Roman Catholic and 40 percent other — Jewish, Hindu, Muslim, Protestant and Eastern Orthodox. Sajid Ahmed, a 19-year-old Muslim student and prayer coordinator for the Muslim Student Association (MSA), said although the atmosphere of the Christmas season brings him happiness, he wishes Muslim holidays were just as prominent. Christmas is a Christian holiday, but is observed by many non-Christians, too. Muslims, however, celebrate two major religious holidays: Eid al-Fitr — a religious holiday celebrating the end of Ramadan (the month of fasting) — and Eid al-Adha, known as the Feast of Sacrifice. Eid is celebrated on different dates each year because the Islamic calendar follows a lunar cycle, as opposed to the more globally used solar cycle. However, Eid al-Fitr usually occurs mid-June and Eid al-Adha occurs toward the end of August. Like Christmas, the Eids are celebrated differently among various cultures, but they traditionally begin with morning prayers and end with family gatherings. Muslim homes in the United States also put up lights and decorations, while Muslim-based countries include those lights and decorations on their streets. So far, in honor of the Christmas season, Loyola has put up lights and trees in various campus buildings. The university participated in its Annual Tree Lighting Ceremony Nov. 28 in the Damen Student Center, which included Santa Claus, an ice rink, hot chocolate and art decorations. But the Eid is celebrated only among Loyola Muslim students themselves, which includes a morning prayer service and a dinner, according to Ahmed. Decorations aren’t hung on campus buildings nor activities hosted by the university. Last year, because the Eid fell during the school year, Ahmed said he had to continue his day with classes after the prayer. Ahmed said the lack of celebration impacts international students and students from out of state the most. “The atmosphere [in Muslim based countries] is a lot different than [in the United States] it’s like Christmas here,” Ahmed said. Omer Mozaffar, Loyola’s Muslim chaplain, said he helps Muslim students request time off to celebrate with their families by asking students’ professors to accommodate for the holiday, which professors usually grant. But because this isn’t always possible for students with a strict school schedule, Ahmed said the university could instead be more festive for Muslim students who stay on campus. “For someone who lives far away and doesn’t have the opportunity to meet up with family, I would say making Loyola’s Eid as festive as possible would be great so that [Muslim students] can feel connected with their heritage and with their religion,” Ahmed said. Demographics within the university might be the reason the university doesn’t celebrate religious holidays to the extent of Christmas. With about 800 Muslim students at Loyola, including international students, according to Mozaffar, there may be a lack of exposure. “I think if the leadership is exposed to the Muslim voice, the voice who wants to make campus more festive for other holidays, I think that’s definitely one step,” Ahmed said. Bryan Goodwin, associate director of the student complex, said demographics don’t guide the decorations during the holiday season. Goodwin said they’d be willing to incorporate as many religions during this holiday season and even during individual times, if those religious groups requested it. Mozaffar also said he doesn’t think the Loyola administration would be opposed to putting up decorations for Muslim holidays, but the dates in which the Eid falls under makes it difficult to address because it happens toward the beginning of the school year. Mozaffar also said the MSA hasn’t proposed decorations either. Ahmed said he still hopes Eid could become more festive at Loyola, though he isn’t confident. For now, many Muslims on campus, including Mozaffar and Ahmed, enjoy the holiday season. One holiday celebrated during the season is Bodhi Day, a Buddhist celebration of enlightenment that occurs Dec. 8. At Loyola, Bodhi Day is recognized by some members of the Hindu Students’ Organization (HSO). Recognizing smaller holidays like Bodhi day is important to Loyola, which desires intellectual diversity, according to Shweta Singh, associate professor in the school of social work and adviser of HSO. Singh said it’s the responsibility of both student organizations representing other faiths and cultures and the university to publicly celebrate as many religious holidays on campus as possible. Muslim students at Loyola have the opportunity to practice their religion freely and peacefully. However, they are not entitled to have their faith promoted or celebrated by the university on the same scale as Christianity. 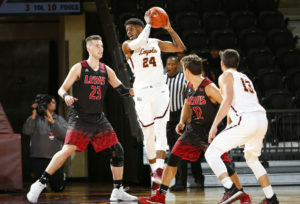 Loyola is a Catholic university, or at least still claims to be. Also, I’d ask the Muslim students quoted how freely or widely Christians are able to celebrate their holidays in the predominantly Muslim countries these students seem to pine for. Maybe they should not be at a Catholic school if Catholicism bothers them so much. Merry Christmas everyone! This ´marginally-religiously´person wants to say thank you for your sentiment! Oh Good Grief! If these whining morons are so principled, let them enroll in one of their Muslim “schools” instead and demand that it celebrate Christmas “inclusively”, as Marco suggests. Do they not really understand how their completely unwarranted sense of entitlement fosters antagonism? These really are bratty, immature little kids and probably shouldn’t be in a university to begin with. Maybe you shouldn’t have voluntarily chosen to attend a CATHOLIC/CHRISTIAN school? If you are so offended by the seasonal celebration of the Christ, perhaps you should join a militant mosque somewhere. If Loyola choses to meekly roll over and show their belly to these ideological terrorists, I have some suggestions for the next muslim “holiday”. Perhaps you could festoon the campus with the bloody entrails of the infidels who have been recently massacred. Place the severed heads along a prominent walkway with a scimitar wielding Imam at the end who will demand either you convert, die or live as a sexual slave if you are female (you can even bring your prepubescent sister along). Personally, after spending a few years in Islamic countries I´m not in the mood to see entrails and whatnot of slaughtered sheep on the sides of roads, garbage cans, etc. Who says “Eid al-Fitr usually occurs mid-June and Eid al-Adha occurs toward the end of August”? This is a basic error of fact. The Islamic calendar year lasts exactly twelve lunar months, which is about 354 days. If Eid al-Fitr occurred in mid-June this year, then next year it will occur in early June, and in May the year after that, and so on. With respect to our civil calendar, every Islamic festival comes earlier every year, and there is no typical “time of year” for it. This is something any Muslim living in any country that uses the civil calendar is familiar with. It makes me wonder how long Sajedah Al-khzaleh has been a Muslim. I remember when I attended Madrassa I was shocked to find they didn’t celebrate Easter. I went right to the Imam and demanded to know why they would celebrate Eid but not the resurrection of our Lord and Savior. They were horrified by their own insensitivity and immediately arranged for a Passion Play to be celebrated even though it was in direct contravention of all their beliefs. So tolerant, and I felt better by making others bow to my beliefs at the expense of theirs. No, this is a Catholic university, which unfortunately is becoming an increasingly rare thing. I see no reason for a Catholic university to celebrate the faith of any other religion, and nor would I see any reason whatsoever for other faith-based universities anywhere in the world to celebrate holidays not exclusively linked to their faith. If Christ truly meant, “No one comes through the Father except by me,” I think it would be wise for a Catholic school to stick exclusively to Catholic holidays. I grew up for a long time going to a very good private Catholic School. We were ALL Roman Catholics. We had to go to confession on Thursday and we were required to go to Mass and do Communion on private masses on Friday. The Archbishop showed up for our Confirmation, all the grades (including K-12) had five hours of religious instruction per week. I dare say a non Catholic at a Jesuit school makes as much sense to me as a screen door in a submarine. That goes as well for our often troublesome but dear cousins, the Protestants and Orthodox. If Master Sadejah feels that his muslim background is not being served at a Jesuit school, I would recommend that he change schools and not try to change the Catholic Church… nevermind of how Leftist the Jesuits in the US have become? Wow. I suppose you claim they celebrate Hanukkah and Christmas at Madrasas and Islamic Universities. A Catholic school has every right to celebrate a Catholic holiday as much as they want. With a mind like yours, I can only conclude you are in a University thanks to affirmative action. You sure didn’t get there on your intellect. So maybe …just maybe you should not go to a Catholic School if you don’t want to see Catholic symbolism. Perhaps you can celebrate Eid by stoning a young lady for the crime of being raped or throwing a gay person off the roof? I agree entirely that greater emphasis should be placed on Easter over Christmas. So Muslim schools celebrate Christmas? Do these morons realize this is a CATHOLIC SCHOOL? Hey guys, you shouldn’t disagree with the author. They might have a truck and go all religion of peace on the students of this Catholic University. Oh I am sure every major Muslim country makes non Muslims feel welcome. Are you really so arrogant to attend a Catholic college and expect them to make you feel special? A university dedicated to a Saint who spread the word of our Lord Jesus Christ through the Holy Spirit, with God our Father, was a poor choice for a school that meets your needs. Did… did these students not notice that they were applying to a Catholic school? Did their finger just slip filling out the college applications, or something? Muslim at Catholic school. I pretty sure I discovered the problem, already. This person is simply dumber than a box of rocks or is attending a catholic school to create chaos and havoc. It’s not so much that this silly student complains about the emphasis on Christmas at a Catholic school, LOL, but that this supposedly superior Catholic school — a Jesuit University, for God’s sake, which I assume has an entrance exam — would take in such an idiot. What has happened to the Jesuits? Brand name has plummeted because all their BS over the past 50 years. When you go to a Catholic University, you should expect Catholic Feast Days and Holidays to be celebrated. Show me which Islamic universities even allow prayer and religious services for Christians and Jews. If you don’t like it there are plenty of secular universities and if that is not enough you are welcome to attend an Islamic University. You are not warranted any special entitlements. What’s Christmas like in Islamic nations? If the larger student body started celebrating their holidays, they would cry “cultural appropriation”. When is everyone going to realize that our society has pinned the name “victim” to anyone who isn’t a white male and many people are only looking for a way to “prove” the validity of the title. Someone should remind the Muslim students that they are not required to pay any extra taxes or face imprisonment or death because they do not follow the same faith as the majority (as is common in Muslim countries). Funny, just teh other day, I was listening to an imam lecturing Muslims to NEVER wish Christians a Merry Christmas. Its’ HARAAM. Christians go out of our way to accommodate Muslims, but they will NEVER appreciate it. Never. Muslims feel entitled to it, in fact. Its that islamic supremacist mindset, where we’re viewed as filthy and their dhimmis. Afterall, their god doesn’t recognize non-muslims as equals to muslims. Jesus tells us to LOVE our enemies. As islamic history shows in Christian lands Muslims have invaded and are now occupying and calling their own, when you keep “loving” muslims, christians end up no longer existing. There is no coexisting with these people, anywhere on earth. They have only one thing in mind…………to rule over you. What a cancer upon earth this religion is. Muslims keep walking over Christians EVERY place on earth. Apparently this uneducated “student” didn’t understand that Loyola is a CATHOLIC institution. Maybe she should have gotten an education on the FACT that Catholics actually celebrate the BIRTH OF JESUS CHRIST in December, and as a Catholic school, Loyola actually follows the teachings of the CATHOLIC RELIGION! If she doesn’t like that, she’s actually free to go find some SECULAR education institution that will comply with her PC BULLYING BS!! We should not be afraid to let uninformed students understand the world does not conform to your wishes and wants from time to time. Islamic traditions and customs are just that Islamic. You may celebrate until your hearts content but leave it at that, be grateful you are free to do so in this great country. My suggestion to the MSA is to focus on giving and not getting in America! That’s the American way, and that’s where you are at the moment, be grateful and discover how you can help and nothing more. How about reconsidering YOUR decision to attend a CATHOLIC university (albeit with administrators that are both dhimmis and dummies)? Would you buy salami and then complain because they contain pork (which is delicious, btw: your loss)? It’s a Catholic college, f#&%mook. If you want an Islamic college, got to Blow Up U.
Catholic school celebrates its two most holy seasons, Christmas and Easter. Hindus and Muslims complain that their holidays aren’t as important. You’re welcome for being admitted to a Christian school. Merry Christmas and don’t let the door hit you as you transfer to a school in India or the Middle East. This is outrageous. I wonder what the reaction would be if a bunch of Christians went to a Muslim university and complained they don’t celebrate Christian holidays. These students have a lot of nerve. She also thinks America gets too much attention on the Fourth of July. Good idea….as soon as all of the Muslim countries start to tolerate and allow Christians to practice their religion without murdering and banning them…then I’m good! YOUR ARE AT A CATHOLIC UNIVERSITY. SHUT UP! stop complaining b/c your religion is incompatible with Western values. Islamic Supremacists are the whiniest mother lickers on the planet. I am sick and tired of these people. Move to a Muslim majority country if you want to celebrate your holidays. I´ve lived and worked for 6 years in 4 predominantly (or wholly) Muslim countries. Most of the people I knew were the most gracious, sincerely welcoming, helpful people I have ever met (and I have worked in other countries including Thailand, Chile, Mexico, Kenya, Lesotho). However, I totally disagree with you here. If I, as a gay man, should expect . . bemoan the fact that a Catholic (or Islamic, or Buddhist, or Jewish or Hindu or whatever) school does not provide a supportive environment for gay people . . . well, then I should keep my mouth shut or leave, correct? adderall and viagra together http://viagrabs.com/ generic viagra.